In December 2011 the EACB issued, in collaboration with the European think tank on co-operative banks, a Call for Papers for the first EACB award for young researchers on co-operative banks. The purpose of this award was to stimulate research on co-operative banks and point out the vital role they play in the economy. Co-operative Banks play a key role in the European financial and banking systems. Half of all existing banks in Europe belong to the decentralised network of co-operative banks while their market share in the enlarged EU is about 20%. In some countries, the market share on deposits lies well above this figure, as is the case in Austria, Germany, Finland, France, Italy and the Netherlands. 1. Ms. Monica Lopez-Puertas Lamy, University Carlos III (Madrid), "Commercial banks versus Stakeholder banks: same business, same risks, same rules?" 2. Mr. Angelo Leogrande, University 'Aldo Moro' (Bari), "Co-operative banks vs. Financial crisis"
3. Ms. Diana Lima, University of Surrey, "Forecasting insolvencies of Portuguese Co-operative Banks"
3. Pf. Davide Salvatore Mare, University of Edinburgh Business School, "Predicting small bank failures using macroeconomic factors"
Call for papers, competition young researchers on co-operative banks. 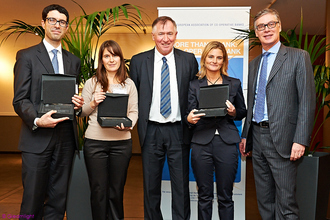 FIRST EACB AWARD for young researchers on co-operative banks (Abstracts of the best papers).